Heroes Productions Ltd is delighted to announce that our first feature film WE CAN BE HEROES, starring Alison Steadman and Phil Davies is to be screened at the 71st Edinburgh International Film Festival in June 2017. 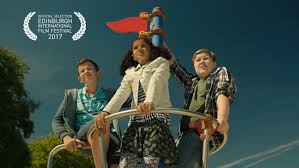 WE CAN BE HEROES is heart-warming, contemporary, adventure featuring three British youngsters who mistakenly think they’ve discovered a threat to national security. The story is full of well-defined, appealing, inspirational characters of all ages; it’s funny, moving, dark in places but warmth and excitement permeates throughout. It has humour, pathos, family conflict. It’s a celebration of childhood with a touch of Manga for good measure. The over-riding themes are Love, Friendship, Relationships, Reconciliation and Hope. WE CAN BE HEROES challenges many current stereo-typical views and has a cracking, unexpected climax with an emotional and uplifting conclusion. Our juvenile leads are Toby Haste (Ben), Marissa Patel (Priti) and Sam Cox (Jed). All three are brand new local talent. WE CAN BE HEROES is their first professional screen performance. WE CAN BE HEROES is based on the popular children’s novel by Catherine Bruton, published in the UK by Egmont Press. The book has been sold internationally, with the UK and Germany its main international market. The book was nominated for the Carnegie Medal in 2012. The film was shot entirely in the UK with 100% of filming taking place in and around Bristol with some location shots in Birmingham.